The No on 1631 campaign contributions break the old record of $24.34 million raised by opponents of a 2013 ballot measure that unsuccessfully sought to require labeling of genetically modified food. A gusher of oil money has boosted to record levels the contributions raised to defeat Initiative 1631, a measure on the November ballot that would set a fee on carbon emissions. As of Monday, the No on 1631 campaign had raised $25.8 million, breaking the old record of $24.34 million raised by opponents of a 2013 ballot measure — Initiative 522 — that unsuccessfully sought to require labeling of genetically modified food. 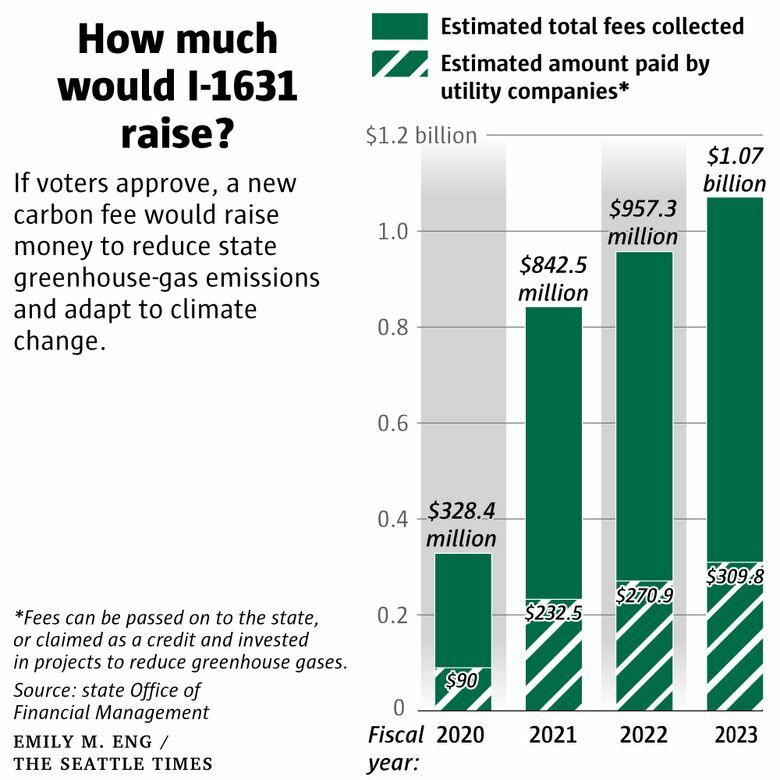 I-1631’s fee would be assessed against greenhouse gases emitted by most fossil fuels combusted in Washington, including most gasoline and diesel fuel used in the state. The fee would raise more than $1 billion annually by 2023 for spending on projects to help reduce greenhouse-gas emissions or adapt to climate change. The opposition campaign committee was formed earlier this year by the Western States Petroleum Association. BP, which operates a Cherry Point refinery, is the biggest contributor to date with more than $9.5 million in cash and in-kind contributions, according to the state Public Disclosure Commission. Other major campaign donors include Phillips 66, Andeavor (now owned by Marathon Petroleum), Valero and American Fuel and Petrochemical Manufacturers. The proponents have raised more than $12.5 million in cash and in-kind contributions, according to the state Public Disclosure Commission. Their biggest donor, so far, is The Nature Conservancy, which has given more than $1.85 million in cash and in-kind contributions. Other major contributors to the Yes on 1631 campaign include the League of Conservation Voters, Bill Gates and Michael Bloomberg. The Yes campaign is still far short of the record amount raised to pass an initiative. Back in 2011, proponents of Initiative 1183 to privatize liquor sales spent $20.2 million in a successful effort to pass the measure.